'Let us pray that Christian communities, especially those who are persecuted feel that they are close to Christ and have their rights respected' Pope Francis has called for people to pray for Christians persecuted "because they speak the truth and proclaim Jesus Christ to this society". The Pope begins the 60-second recording released on Wednesday 6 March by telling listeners that there are more martyrs today than in the first centuries. 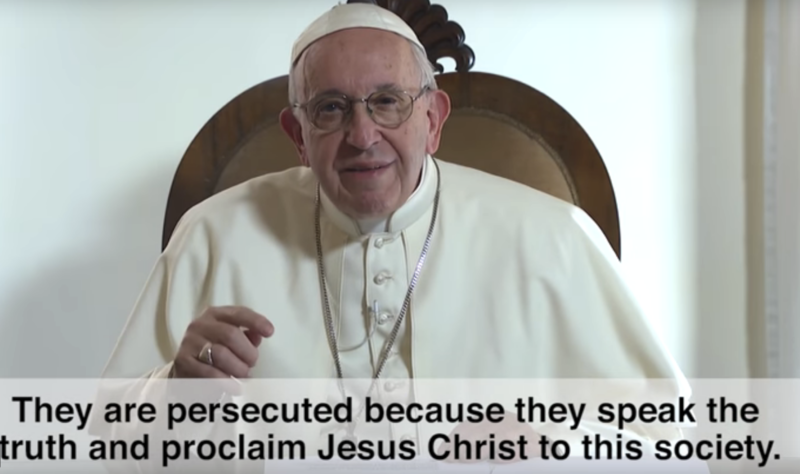 “They are persecuted because they speak the truth and proclaim Jesus Christ to this society”. Part of a monthly series called ‘The Pope Video’, the one minute video has been produced by the Pope’s Worldwide Prayer Network in association with Vatican Media and Aid to the Church in Need, the Catholic charity which supports persecuted and other suffering Christians. In the video, the Pope states that, as well as being a problem in countries lacking religious freedom guarantees, persecution occurs in places where such rights are protected “in theory and on paper”. “Let us pray that Christian communities, especially those who are persecuted feel that they are close to Christ and have their rights respected”, Francis concludes. Christians in the Middle East suffer the most religious persecution and have experienced genocide in their ancient homeland and elsewhere, with systematic attempts to eradicate their presence, ACN report. According to the charity’s two-yearly reports ‘Religious Freedom in the World’ and ‘Persecuted and Forgotten’ which assesses anti-Christian oppression, Church communities and other minorities are also under increasing threat in parts of the Middle East as well as India, Pakistan, China, Iran and Russia. According to the anti-persecution charity, Open Doors International, the number of Christians persecuted for their faith globally has risen by more than 13 per cent. The charity estimates that 245 million Christians worldwide face high levels of persecution in 73 countries this year, up from 215 million last year in 58 countries the previous year. In December of last year, Foreign Secretary Jeremy Hunt said the UK “must do more” to help persecuted Christians and ordered an independent review to assess if the British Government is doing enough. The Foreign Office review, due to be published at Easter, is being led by Bishop of Truro, Rt Rev Philip Mounstephen, and will make recommendations on the practical steps the government can take to better support some of the 215 million Christians globally who faced persecution last year.